U.S. Highway 27 meets M.L. King Boulevard in downtown Chattanooga. 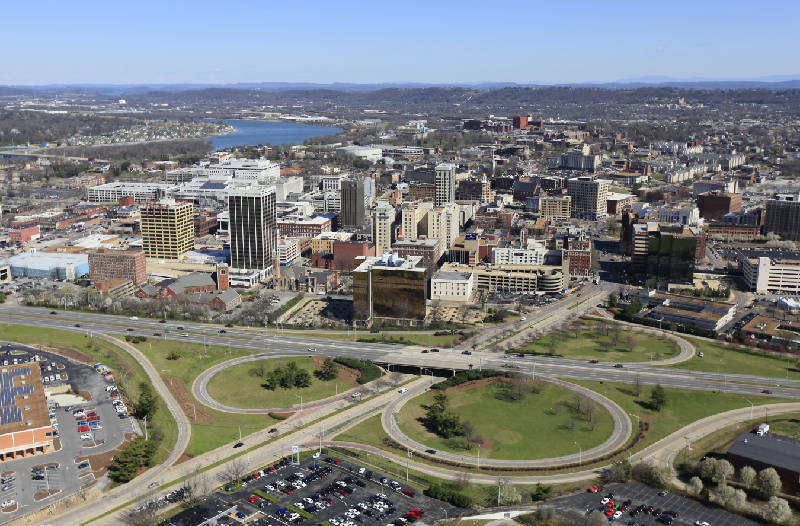 A new $80 million plan shows dramatic changes to U.S. 27, the arterial highway that pumps more than 70,000 cars per day through the heart of Chattanooga. Under the plan released by the Tennessee Department of Transportation, not much will remain of the southern portion of the expressway -- the 1.5-mile stretch between Interstate 24 and the Olgiati Bridge -- that has roots dating back to the 1940s. "Even when the design was built, it was below standard, but compromises were made in the design to allow for the fourth street interchange," according to Jon Van Winkle, city traffic engineer. The overhaul of the southern portion of U.S. 27 will be massive when it's finished in 2016, said Ken Flynn, an engineer for the state. "We've got our money's worth out of it but it is time to replace it," Flynn said. "We're replacing all the bridges and almost every one of the interchanges will have some sort of modification to them." The full three-phase rehabilitation of U.S. 27 is already under way north of the Olgiati and eventually will include a new lane on the bridge itself, as well as significant changes to the roadway that links the bridge to I-24 through downtown. The plan for the southernmost portion reimagines the highway's ties to the city, with a new roundabout at M.L. King Boulevard and new interchanges at Fourth, Sixth, 13th and Main streets. It's taken time to iron out the details of the project after a previous attempt about 20 years ago was "talked to death," said Chattanooga Mayor Ron Littlefield. "I'm just glad that we're finally getting it done," Littlefield said. "Everybody's got their own ideas about how ramps should go and such, but I think it's a great project." The current mishmash of on-ramps, off-ramps and S-curves in the downtown portion of U.S. 27 are going away in favor of a frontage road that pulls southbound traffic off the bridge, then funnels motorists alongside U.S. 27 toward a series of stoplights that allow lefthand turns under the highway at Fourth and Sixth streets, according to the new plan. "What this frontage road allows us to do is bring people out, turn them parallel and make slower, 30-mph turns instead of making a 60-mph turn [at current exits]," Flynn said. Workers will refine the M.L. King Boulevard interchange, which is accessed by the same single exit for southbound traffic off the Olgiati Bridge. The new interchange will be a more elegant gateway to Chattanooga with a roundabout, pedestrian walkway and half cloverleaf on-ramp. But the most striking addition is a soaring on-ramp that conveys vehicles northbound from M.L. King Boulevard all the way to the Olgiati Bridge, passing over Fourth Street as it flies alongside U.S. 27. "Right now, you have the on-ramp at MLK and the off-ramp at Fourth Street kind of fighting for the same territory," Flynn said. By straightening out the road's S-curve, engineers hope to free up enough real estate to make the road safer -- and faster. "This flyover road takes up a little bit of the real estate we get from the S-curve, but it separates people from competing for the same area," Flynn said. "It gives people freer rein and is safer." In a less significant but still extensive alteration, workers will transform Main Street's connection to U.S. 27 by removing the existing off-ramp, which is too sharp to meet today's safety standards, and build a gentler exit that ends at 13th Street. Local officials express a mix of admiration and apprehension at the modernization of the southern portion of U.S. 27. While changes to the road are much-needed, they say, some disagreement still surrounds the roundabout at M.L. King and the Fourth Street interchange. Some want more roundabouts, some want none, and others worry that the project could take up valuable downtown property. "TDOT has been very responsive in listening to us," said Kim White, president of nonprofit developer River City Co. "We haven't gotten the answers we want yet, but they've been listening to us." Her concern is that, unlike a traditional traffic light, the M.L. King Boulevard roundabout is harder for pedestrians to navigate because traffic will never really stop. "Our concern is for pedestrian access, and the fact that we think it has the potential for cutting people off on the Westside, which is already cut off," White said. She's also worried that the Fourth Street on-ramp takes up scarce downtown land that could be developed instead. "I would like them to look at our recommendation for that on-ramp to give us more property that's developable," White said. "If you look at tax revenue, that's a very valuable piece of land." State engineers say that, while the plan is still a work in progress, the M.L. King roundabout was actually the city's idea. "The whole point of building a roundabout is that it slows down traffic," said Van Winkle, a local proponent of roundabouts. "It's a landmark, really." Van Winkle said he would have pushed for another roundabout at the southbound frontage road, but "there wasn't enough room." However, smart use of traffic lights can keep the flow of cars moving without getting backed up onto 27, he said. Who: A team of local designers led by Eric Myers of Elemi Architects will present a plan for Fourth Street that starts at the street's interchange with U.S. 27 and extends through the Market Street intersection. Tennessee Department of Transportation engineers will be present. The bigger issue is how to mitigate the tall retaining walls that will line parts of the new road, officials say. Rather than settling for a stark concrete canyon, city planners are pushing TDOT to beautify the project. Members of an advisory committee, which includes White, are asking for decoration of the walls and roadways as part of the project and are hoping to bring in local artists to add some flair to the concrete slabs, she said. Though the state may not be able to comply with every city request, Flynn said his agency will consider any proposal. "We're looking at full-blown landscapes, trees and textures on concrete retaining walls that are normally kind of unsightly," Flynn said. "We're willing to work with them to turn those into almost art if we need to and enhance them to get the textures and feel for the downtown area." Minor disagreements in a project of this scope are to be expected, Littlefield said, but Chattanooga can't make perfect the enemy of good -- that's how the last attempt at a new highway got derailed. "People are still concerned, but I believe that we certainly have gone as long as we can go without undertaking some type of improvement," he said. "At a certain point, the poor conditions of the road and the overcrowdedness and engineering problems were beginning to hamper the growth and development of downtown." And regardless of what the final plan looks like, it's better than the current road, he said. "Even though some of the changes might not be what everyone would like to see, once it's done, people will see the benefits of the entire project," he said. "I think it's a good change."